Disneyland at Christmas! 10 Magical Things About the Holidays at Disney! September 20, 2017 By Tina M 1 Comment This post may contain affiliate links. Read my disclosure policy here. The Holidays at Disneyland Resort are coming soon and I couldn’t be more excited! Starting on November 10, 2017, The Merriest Place on Earth is going to be more joyful than ever. You can experience all the jolly fun until January 7, 2018. 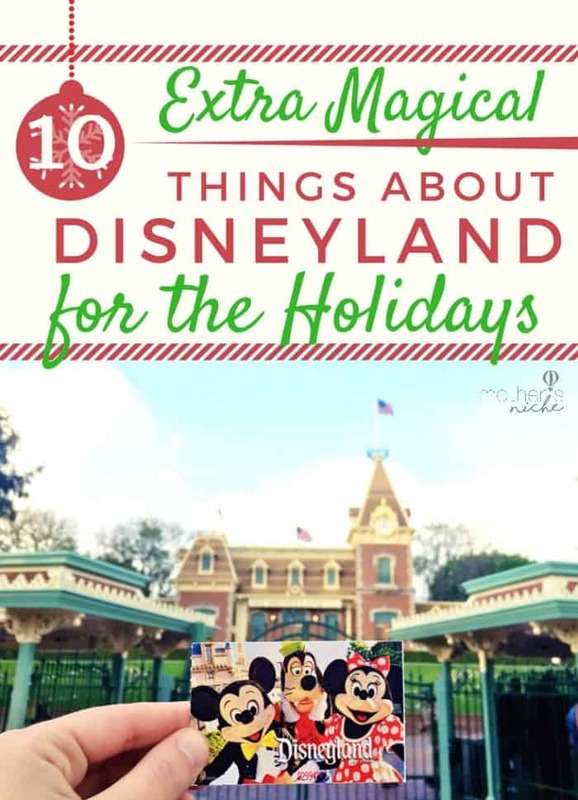 Here are 10 extra magical things about Disneyland at Christmas, to help you have a magical vacation during the most wonderful time of the year. If you’re looking for discount Disneyland tickets to participate in the jolly celebration, be sure to contact Get Away Today. They currently have an Extra Day Free offer, where a 5-day Park Hopper ticket is the price of a 4-day ticket! That is an extra day FREE to experience everything that Disneyland at Christmas has to offer. You can also get Adults at KIDS PRICES during the holidays (valid for travel dates: Nov 1st-23rd and Dec 1st-22nd). Stack the promo code at the end of this article for an extra $10 off (promo code is good for travel at any time). What Makes Disneyland at Christmas So Special? World of Color will always have a special place in my heart and World of Color – Season of Light is no exception. The holiday themed event includes your favorite holiday tunes to the scenes of classic Disney and Pixar movies mixed with beautiful fountain arrangements. If you love the original World of Color, you’re sure to enjoy this festive show. This is the perfect way to get you in the holiday spirit and create memories that you will never forget. The Festival of Holidays debuted for the first-time last year and instantly became a cherished event. Because of this, the festival is returning in 2017 to be enjoyed once more. Located in California Adventure, the Festival of Holidays includes festivities such as dances, crafts and music inspired by cultural traditions from all around the world. With multiple kiosks, each showcasing a different country’s food selection, make this your chance to experience the Holidays like never before. Decorating the Christmas tree is one of my favorite parts of the Holidays and Disneyland does this like no other. The massive Christmas Tree on Main Street, U.S.A. is one of the greatest sights to behold! The tree is lit up from top to bottom with ornaments and cheerful decorations, making it a perfect opportunity for a memorable holiday picture. Another magical sight to see this holiday season is Sleeping Beauty’s Winter Castle. You can see thousands of luminous lights and holiday garlands embellished onto the castle, making it even more beautiful than before. The Haunted Mansion ride overlay is one of the main reasons I love to go to Disneyland during this time of year. Jack Skellington and his friends from “The Nightmare Before Christmas” haunt the beloved attraction and turn it into a joyful and spooky experience like you have never seen before. Another must see attraction during the Holidays at Disneyland is “it’s a small world” Holiday. The classic ride gets decked out in yuletide joy that includes bright lights, festive décor and even a new song! You’ll be sure to feel the holiday spirit as songs of good tidings are sung. If you love the classic puns and enjoyment of the Jungle Cruise, then you won’t want to miss the Jingle Cruise. Just like the original, the Jingle Cruise will have you laughing all the way. Don’t miss this cherished attraction, with a joyful twist this holiday season. The perfect way to end your day at Disneyland is watching the fireworks with the ones you love. Now, the Believe… in Holiday Magic! Fireworks will make the tradition even more special. Classic Christmas music is combined with beautiful lights and fireworks making it a show that is truly remarkable. You might also be able to see it snow on Main Street, U.S.A. during the event. This is an extraordinary sight to behold when you are in sunny, Southern California! 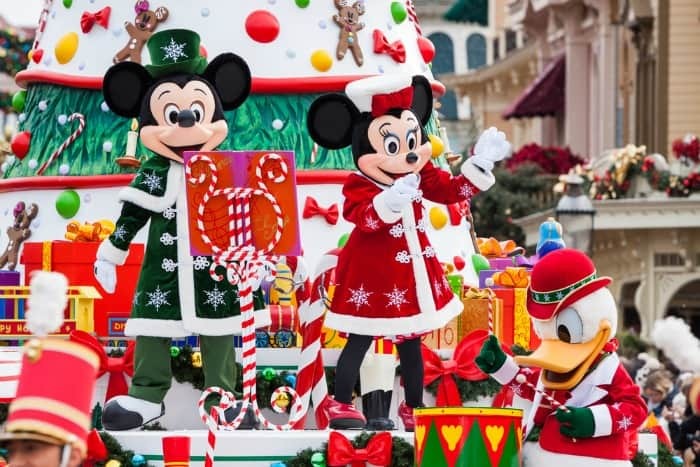 A Christmas Fantasy Parade is sure to be a hit for you and your family when visiting this time of year. 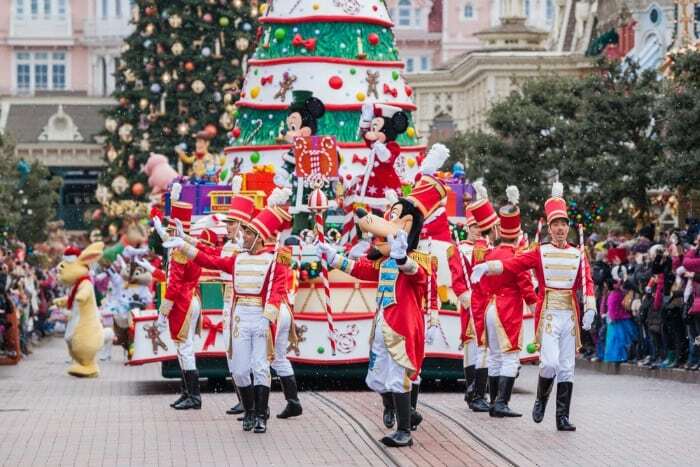 Your favorite Disney characters will parade down Main Street, U.S.A. with dancing gingerbread people, prancing reindeer and toy soldiers which will make this a holiday treat you’ll be sure to enjoy. 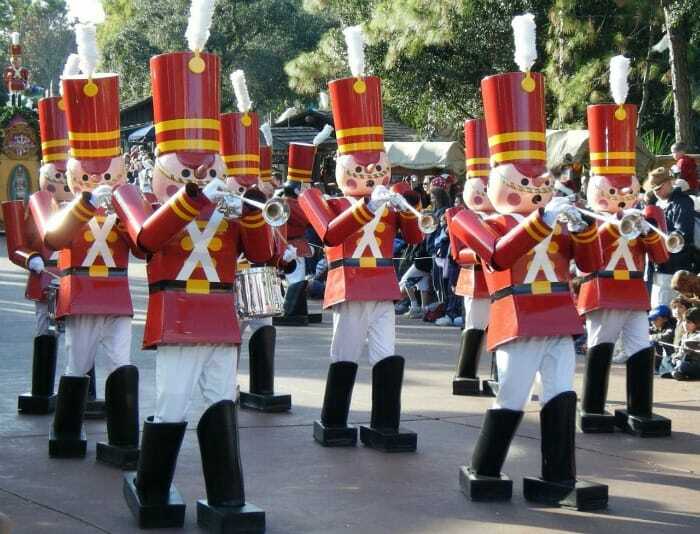 This parade is a popular event in Disneyland, so be sure to secure a spot early. The treats at Disneyland are always delectable and eating them during the holidays somehow makes it sweeter. Enjoying Disneyland at Christmas includes special treats such as Peppermint Stick Ice Cream, Plaza Inn Yule Log, hand-made candy canes (and so many more scrumptious snacks and deserts). I can guarantee that your sweet tooth will be satisfied when you visit The Merriest Place on Earth! In addition to all of these sweet treats, you can also get exclusive souvenirs such as holiday ears, ornaments and Christmas pajamas for the entire family. Last, but certainly not least, you can meet the one and only Santa Claus! Before the Jolly Old Saint Nick travels around the world on Christmas Day, he is taking a stop in California Adventure. You can meet Santa and his elves at the Redwood Creek Challenge Trail. This is the perfect time to let Santa know how good you’ve been throughout the year and your wish for a Disneyland vacation next year too! Now that you know all of the magical events going on during The Holidays at Disneyland Resort, book your trip soon so that you can get the very best hotel deal! If you use Get Away Today to get the best deals, make sure you use code MothersNiche and get an additional $10 off your vacation package. You can book online at getawaytoday.com or talk to their travel experts at 855-GET-AWAY. You can also read up on our other Thrifty Disney Tips to get the most out of your time at the park! What are YOUR favorite things about Disneyland at Christmas? myself my son works at the park and I still couldn’t find out why. Hopefully it’s back in 2018.